Abundant snowfall greeted 143 alpine ski racers Friday through Sunday on Baldy's Hemingway, Cozy and Greyhawk ski runs for the Allan Patterson Memorial and Laura Flood Memorial A/J1/J2 races. The host Sun Valley Ski Education Foundation posted some top results spread among its 18 entrants in the three-race Intermountain Division series. First-year J1 (ages 17-18) racer Teagen Palmer felt comfortable surrounded by a podium full of Montana State University Bobcat women. 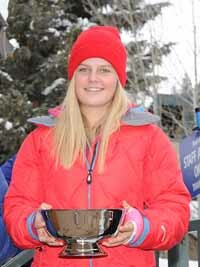 Palmer, 17, won her J1 class in the Flood slalom and giant slalom Saturday and Sunday. In slalom, Palmer was second overall of 53 starters, trailing only MSU sophomore Marissa Riopelle of Canada. Harlan Collins, 18, a consistent second-year J1 from Hailey, cracked the top five in his class all three days—fifth in Friday's Patterson GS, fourth in Saturday's Flood GS and second in Sunday's Flood SL. In the slalom, Collins was second overall .41 seconds behind winner Max Martin, 18, of Utah's Rowmark Ski Academy. Independent racer Miles Fink-Debray, 23, of Ketchum was the overall winner of Friday's Patterson GS and added another win in a 90-skier field for Saturday's Flood GS. SVSEF J2 racer Garrett Lodge won his class in Friday's Patterson GS, in 16th place overall. Flood Memorial combined J2 winners for the two days of great Sun Valley racing were Bryce Astle, 17, of Snowbird, Utah and Mallory Kelley, 17, of Red Lodge, Mont. Astle DNFd Friday's second run of the Patterson GS, but he came on strong in the Flood. Astle was the second J2, 14th overall, in Saturday's GS and sixth overall, the first J1, in Sunday's SL. Kelley placed 12th and 17th overall in the Flood SL and GS races. The Patterson Memorial, remembered the Hailey downhiller who died in 1977 at age 20. The 22nd annual Flood Memorial honored the memory of the Sun Valley racer who died in 1990 at the age of 19. Randy Flood represented the family at Sunday's awards fete. Other SVSEF placings in the Patterson—J1 men: 6—Tanner Dirstine. 9—Connor Farrow. 24—Colin Waycott. J2 men: 4—KJ Savaria. 6—Tanner Josey. 15—Logan Shipley. 19—Taylor Adler. 20--Cole Caulkins. Also racing were Kipling Weisel and William Harder. J2 women: 20—Sofia DeWolfe. 24—Jordan Fitzgerald. In the Flood, Dirstine continued his solid skiing with a J1 sixth place in GS and fourth in SL, 10th and 9th overall. KJ Savaria podiumed Sunday with a J2 third place in slalom, while Josey was fifth and Lodge ninth in the same J2 class. Older SVSEF racers will compete in the Park City FIS Elite technical races this coming weekend. Qualifying for the event were Teagen Palmer, Sierra Fox, Amanda Stelling, Harlan Collins, Kipling Weisel, Tanner Dirstine, KJ Savaria and Connor Farrow. Two SVSEF J3 (ages 13-14) alpine racers podiumed during the Sean Nurse Memorial technical events Jan. 21-22 on Cougar and Elk runs at Jackson Hole's Snow King Resort. All told, there were 24 SVSEF kids competing in the field of 61 boys and 57 J3 girls. Second-year J3s Jay Fitzgerald and Samantha Busby each placed second in Saturday's Elk giant slalom. First-year J3 Will Snyder logged solid back-to-back results with a sixth GS and fourth in SL. Placings by day: Jay Fitzgerald 2-GS/5-SL; Will Snyder 6-GS/4-SL; Austin Savaria 18-GS/6-SL; Yuri McClure 19-GS/9-SL; Emmett Say 16-GS/13-SL; Gavin Shipley 25-GS/17-SL; Griffin Curtis 17-GS/DNF-SL; Wyatt Smith 20-GS/39-SL; Trenor Gould 29-GS/DSQ-SL; John Blackburn 33-GS/23-SL; Michael Levy DNF-GS/18-SL; Travis Flynt DNF-GS/37-SL. Also competing were Duncan Fuller, Taylor Cooper and Patrick Riedinger. Also, Samantha Busby 2-GS/35-SL; Haley Cutler 9-GS/26-SL; Alexandra Black 19-GS/10-SL; Madison Milgard 11-GS/7-SL; Olivia Wentzell 15-GS/19-SL; Poppy Ellie Vorse 17-GS/23-SL; Loni Unser 24-GS/32-SL; Margot Griffith 25-GS/18-SL; Hallie MacPherson 33-GS/28-SL. Others competing were Isabella Welsh and Josie Allison. Twenty-seven younger SVSEF alpine kids in the J4 (ages 11-12) through J6 (7-8) classes joined a field of 145 youngsters from Idaho and Wyoming in the 61st annual Cranston Cup North Series slaloms hosted by the Bogus Basin Ski Education Foundation Jan. 21-22 at Tamarack near McCall. J4 girls: 1—Pilar Pennell. 4—Molly Milgard. 6—Libby Kaiser. 9—Alyssa Ritzel and Sage Rheinschild. 10—Katelyn Rathfon. 14—Libby Lindstrom. 15—Sophia Schwartzman. 17—Katherine Lemma. Also racing were Lucy More, Riley Revallier and Bailey Holter. J4 boys: 2—Jake Blackburn. 6—Tobias Verheijen. 8—Cooper Dart. 10—Will Griffith. 13—Charlie Stumph. 16—Ethan Daves. Also racing was Noah Leininger. J5 girls: 1—Madison Ferris. 10—Sage Curtis. Also racing was Lily Fitzgerald. J5 boys: 1—Wyatt Minor. 4—Bennett Snyder. 14—Charlie Snyder. J6 girls: 1—Marit Kaiser. 2—Anhwei Kirk.